The SR865A Lock-In Amplifier offers superb performance and outstanding value. With 4 MHz frequency range, time constants from 1 µs to 30 ks, very low noise front-end amplifiers, and a modern, intuitive user interface, the SR865A is the ideal choice for any synchronous detection application. The SR865A Lock-In Amplifier offers superb performance and outstanding value. It's what you’ve come to expect from a Stanford Research Systems lock-in amplifier. With 4 MHz frequency range, time constants from 1 µs to 30 ks, very low noise front-end amplifiers, and a modern, intuitive user interface, the SR865A is the ideal choice for any synchronous detection application. With over 30 years of lock-in design experience SRS has made every effort to optimize each detail of the SR865A. From a hefty toroidal transformer that eliminates switch-mode noise to iOS connectivity that brings the lock-in to your cell phone to advanced DSP filters that eliminate more noise while speeding up your experiment, the SR865A is truly the ultimate lock-in amplifier. Lock-in performance starts at the front end. The SR865A front end offers both state-of-the art voltage and current input amplifiers. The voltage input is a switchable single-ended/differential JFET-pair amplifier with 2.5 nV/√Hz of noise at 1 kHz and under 10 nV/√Hz of noise at 10 Hz. The voltage input has a 10 MΩ input impedance and can be AC or DC coupled. Input connector shields can be connected to the instrument ground through a user selectable 10 Ω (Ground) or 10 kΩ (Float) resistor. The SR865A’s built-in current amplifier represents a significant improvement over previous designs. The current input range is selectable from 1 μA or 10 nA. The 1 μA range has 400 kHz of bandwidth and 130 fA/√Hz of noise, while the 10 nA range offers 2 kHz of bandwidth and 13 fA/√Hz of noise. While the built in voltage and current amplifiers are suitable for most applications, the SR865A is also compatible with the complete range of specialized pre-amplifiers offered by SRS. The SR550 (FET input), SR552 (BJT input), SR554 (transformer input), SR555 (120 kHz current amp) and SR556 (low noise current amp) can all be powered directly from the SR865A’s rear-panel preamp power port. As with previous instruments, the Sensitivity setting of the SR865A is the voltage (or current) which produces a full scale output. But unlike previous designs, the input range of the SR865A can be explicitly set from the front panel without having to consult a confusing “dynamic reserve” equation. Simply choose the sensitivity required by your experiment and then select the smallest input range that doesn’t overload. That’s it. The SR865A’s effective dynamic reserve is simply the ratio of these two settings. For instance with a 10 nV sensitivity setting and a 300 mV input range the effective dynamic reserve of the SR865A is 3 × 107, or nearly 150 dB. The SR865A offers traditional RC-response output time constants from 1 µs to 30 ks with rolloffs of 6, 12, 18, and 24 dB/oct. But in addition, the SR865A also offers advanced digital filters which can significantly reduce measurement time while increasing signal to noise. Below 3 s, the advanced filters are Gaussian FIR filters which at the same noise bandwidth as an RC filter have significantly better rise-time and stopband attenuation. These filters also have symmetric rise and fall profiles which preserves feature shapes while scanning in frequency. At time constants longer than 3 s, the advanced filters are linear phase IIR filters which settle nearly twice as fast as their RC counterparts for equivalent stopband attenuation. Synchronous filtering may also be selected at reference frequencies below 4 kHz. The synchronous filter notches out multiples of the reference frequency and is extremely useful in making low frequency measurement where multiples of the reference frequency would otherwise show up in the lock-in output. Unlike previous designs the synchronous filter in the SR865A can be selected with no loss of output resolution. The SR865A has a specified reference frequency range of 1 mHz to 4 MHz. Detection can be done at the fundamental of the reference frequency, or at up to the 99th harmonic. Several reference modes are available: Internal mode uses the SR865A’s precision internal oscillator as the reference. External mode locks to an external sine or TTL signal. In Dual Mode, the lock-in detects at the difference frequency between the internally set reference frequency and an externally applied sync signal allowing direct recovery of a double-modulated signal. Finally, in Chop mode, the SR865A provides a digital PID (Proportional-Integral-Derivative) controller signal to synchronize an SR540 Optical Chopper to the internal oscillator of the lock-in. By having the lock-in directly control the chopper, frequency drift can be virtually eliminated. The SR865A offers a precision sine wave output which can be set with 6 digits of frequency resolution and an amplitude range from 1 nV to 2 V. The SR865A output is unique in that it can be configured as a single-ended or as a differential (balanced) signal. 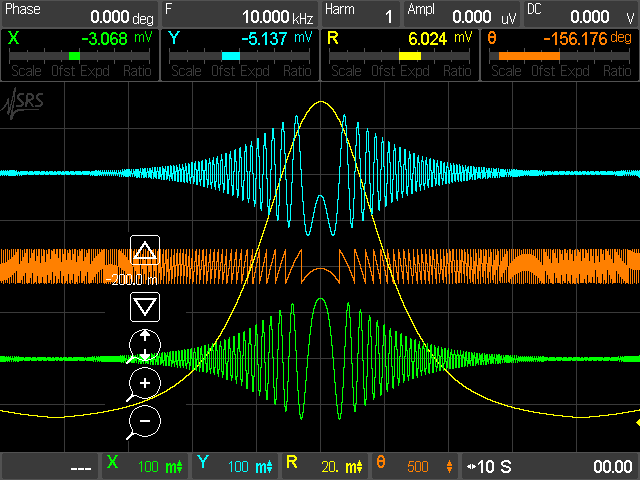 A DC offset of up to ±5 V can be applied to the sine output. A rear-panel logic-level sync signal synchronized to the sine output is also provided. Rear-panel 10 MHz inputs and outputs are provided allowing the SR865A to be locked to an external frequency reference (such as the FS725 10 MHz Rubidium Frequency Standard). Alternatively, the 10 MHz output from the SR865A can be used to synchronize several lock-ins or other test equipment with a 10 MHz timebase input. Lock-in amplifiers are traditionally time-domain instruments but sometimes it’s easier to understand a signal in the frequency domain. The SR865A is at home in both worlds. An FFT display shows the spectrum of the input signal at the front end, the post-mixer signal, or the spectrum of the signal after the time-constant filters. Using the FFT displays can simplify tracking down sneaky noise sources that would otherwise get lost in the “one-number” output of a conventional lock-in amplifier. The center of the SR865A’s front panel is a full-color 640 × 480 touchscreen which can be set to display up to 4 channels of data. (When a dark lab is required, the LCD screen can be blanked from the front panel or from the remote interface.) 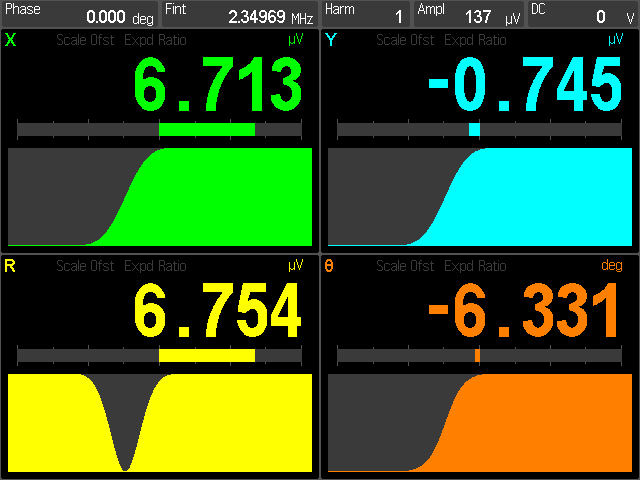 Each data channel can be configured to display X, Y, R, Θ, Aux In (1-4), Aux Out (1-2), X noise, Y noise, Sine Amplitude, Sine Out DC Level, Reference Phase, or Reference Frequency. The screen can be set up to show the data channels as large numbers, easily visible from across the room, or as a “strip-chart” display showing a complete history of each channel with selectable time scales from 0.5 s/div to 2 days/div. Even when not displaying a measurement, all measurements are always being saved by the SR865A insuring that no data is ever lost. 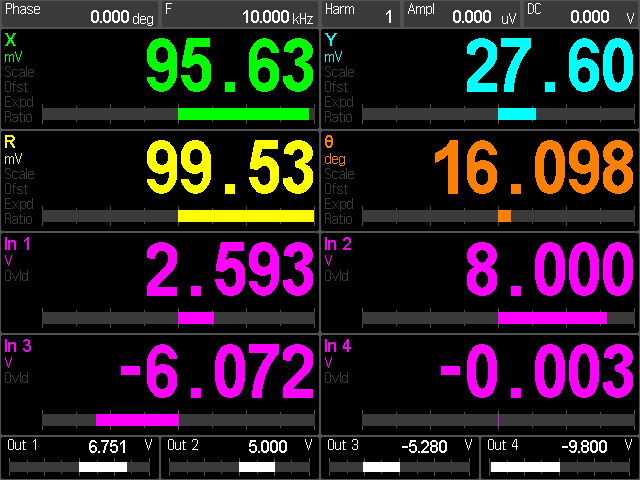 The touchscreen also continually displays key lock-in setup parameters such as phase, reference frequency, and sine amplitude. And a rear-panel HDMI port allows the LCD screen to be viewed on any HDMI monitor or TV. It should be emphasized that as useful as the touchscreen display is for displaying data, it’s not necessary to use the touchscreen to control common instrument functions on the SR865A. All commonly used controls: time constant, reference frequency, sine amplitude and offset, input configuration, and more, are controllable with dedicated front panel knobs or buttons. Infrequently accessed configuration settings, such as the TCP/IP settings and other communication settings, are accessed through menus shown on the touchscreen. The SR865A comes standard with virtually every remote interface imaginable. GPIB (IEEE488.2) and RS-232 are of course provided, as well as USB (Test and Measurement Class) and Ethernet (VXI-11 and telnet). The SR865A hosts its own webserver allowing the instrument to be monitored and controlled remotely with just a browser. And when connected to a Wi-Fi enabled network, the SR865A can be controlled remotely from an iPhone or iPad with free iOS app downloadable from the Apple App Store. The app allows remote configuration of the instrument and monitoring of live data from your handheld device. A front-panel USB port allows data and screen-shots to a USB flash drive. Data can be saved either as comma delimited files or MATLAB compatible .MAT files. Incorporating screen shots and data into reports or spreadsheets has never been easier. Voltage Input range 10 mV to 1 V (peak). Gain accuracy ±1 % (<200 kHz), ±2 % (to 4 MHz). Signal amplitude must be less than 30% of input range. 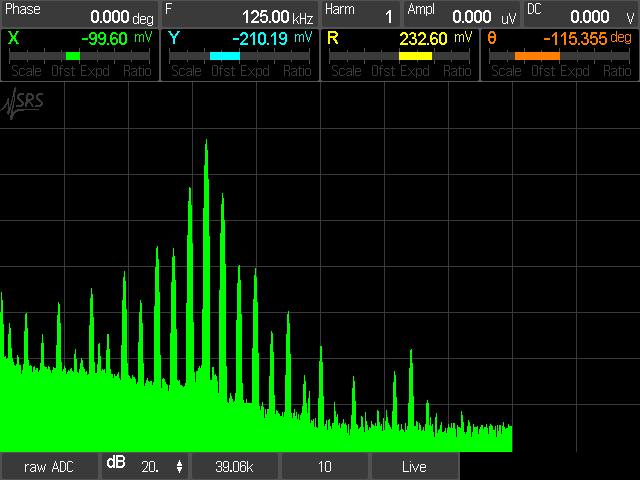 Frequency range 0.001 Hz to 4 MHz, specified. Low latency output Rear-panel BlazeX output with <2 µs delay (plus LPF rise/fall times). Data history All data sources are continually stored at all chart display time scales. The complete stored history of any data source can be displayed at any time. at sample rates up to 1.25 MHz. This is in addition to the data histories for the chart display. fint, Sine Out Amplitude, Sine Out DC Level, Aux Out 1 or 2. Interfaces IEEE488.2, RS-232, USB device and Ethernet.